Its been ages I did an outfit post on the blog( wish i could tell ya, how i missed ur good ol comments) ! And I have plenitude reasons for not posting ! But let me not Harsh your Marsh mellows, and straight away come down to business ! lol ! I decided to keep my look minimal, hair tied in a simple pony, Optical Print semi sheer chiffon blouse,some High Waist neon shorts to combat the gloom around,minimal make up(I used sunscreen) and if you sweat like a piggy,but intend to wear your make-up then I suggest you carry some blotting sheets around ! I have been using shisedo ones, and they are extremely good ! If possible get rid of big and chunky accessories, and stick with the dainty ones ! AVOID perfumes! Sweet heavens, you don't want to suffocate yourself and the people around you. If you want to smell nice though, use a really light body spray. And for hair, I say just keep it simple, because that's the key with hot weather. Get a heat tamer or leave in conditioner, to protect your hair from all the heat outside. And avoid using a lot of heat tools. That's my way of beating the humidity blues ! Do add up if you know of any other !! ohhh, awesome shorts and i love the way you matched them with your heels! great! It will be a repeat comment but you look really really gorgeous. Among all big flashy things, the earrings show up equally nicely. 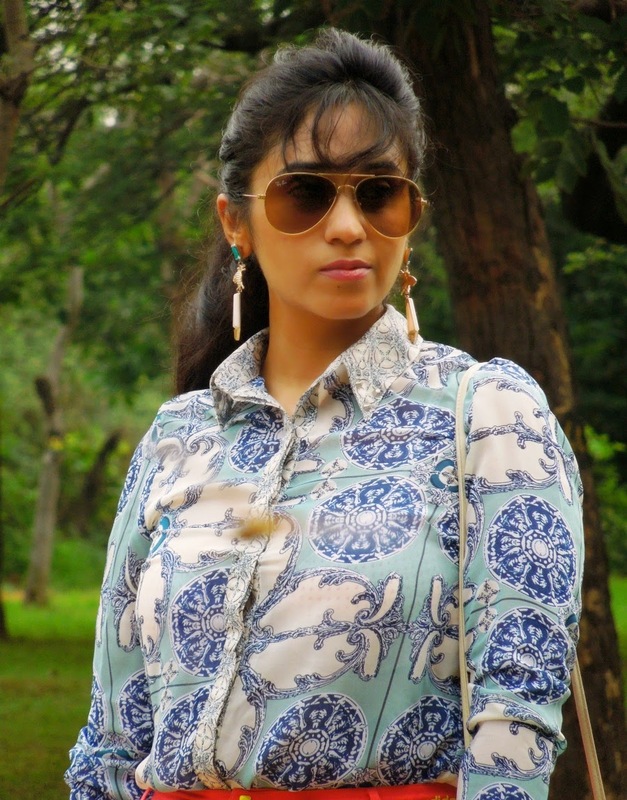 Beutiful blouse and sunnies. Great day. You look fantastic! I love that top, the print is really great! Hey beautiful ladyyy!!! Just followed you on GFC, and I am going to follow you on bloglovin.. Hope you will do the same!! Keep in touch!!! What a lovely mix of pattern and color! 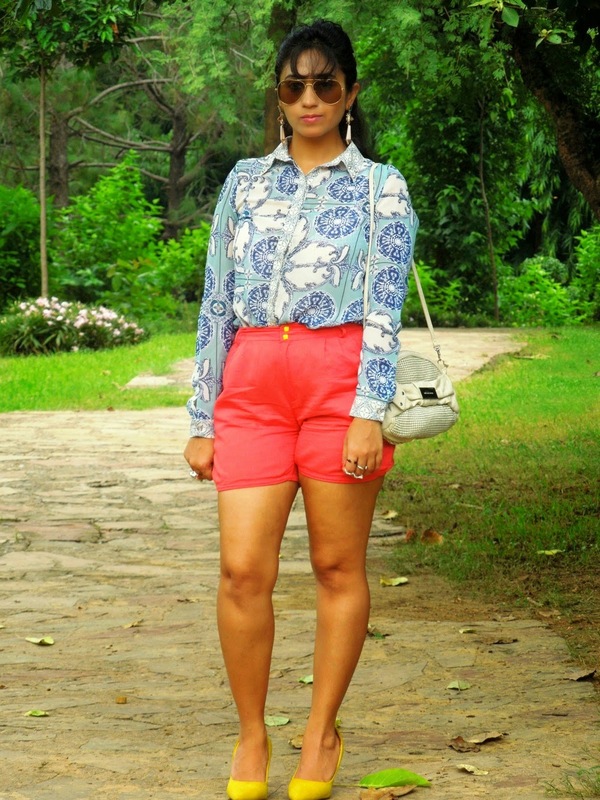 I love the printed blouse so chic and the pumps are just fantastic! fantastic outfit;) Do you like to follow each other? I love high waisted everything. Nice outfit, so colorful. You are so good with the high waisted trend. 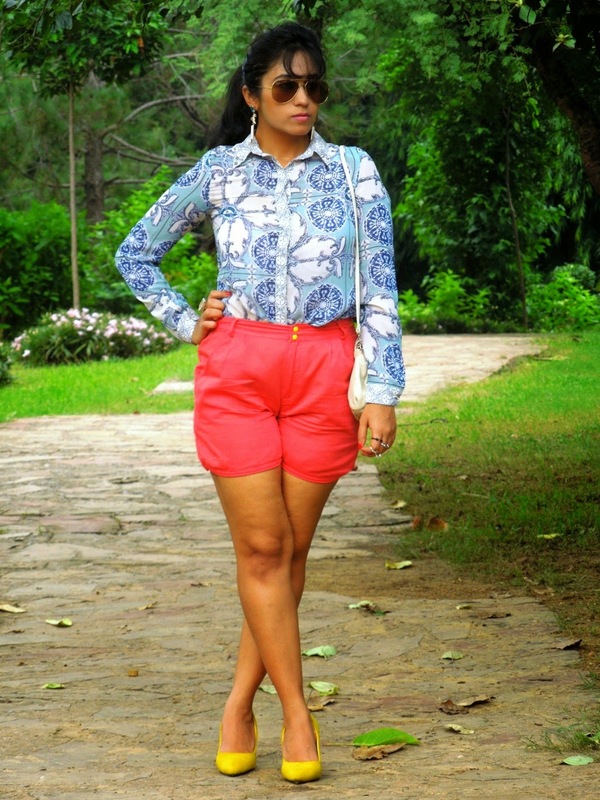 I love the color of the shorts and the prints of your shirt! i like this color combination and that shirt is adorable! Hello dear,your shirt is AMAZING! !love all the outfit! !thanks for your beautiful comment!wish you a beautiful weekend! so pretty, like your shorts. love it..i love the 80's vibe your bangs and those glasses are giving..and we need more shorts for these humid days. 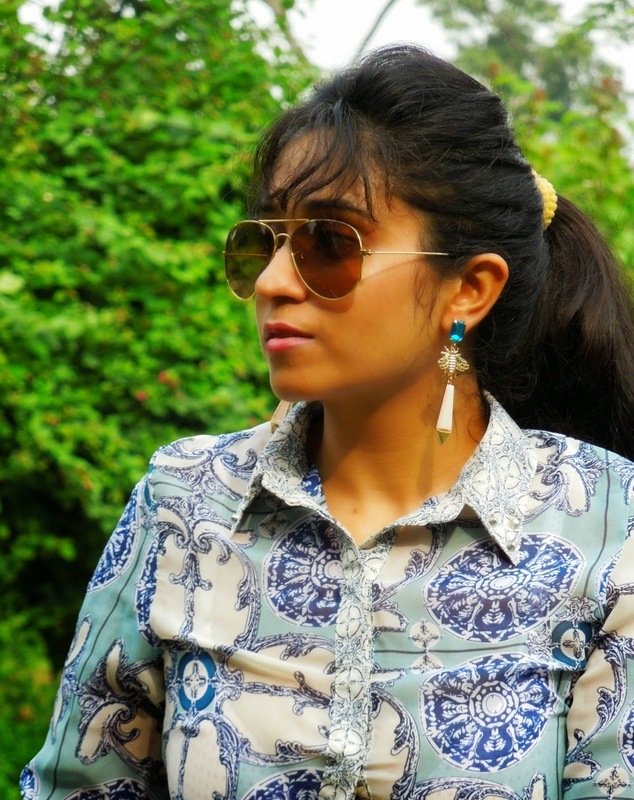 The classic print of your shirt is amazing! This bold print trend reminds me of my mom. I love it on you! Lovely combination you look stunning as always.. I love the print on your top, gorgeous! I'm in love with your top!!! 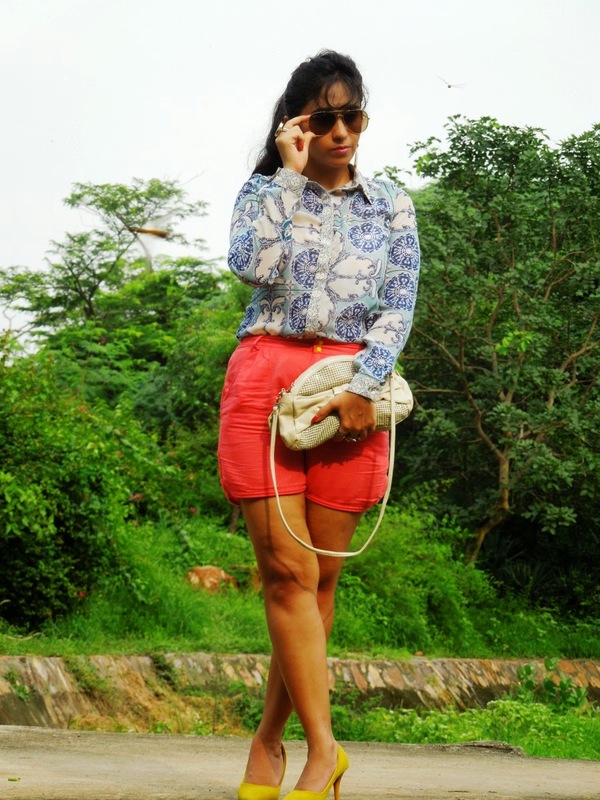 Surbhi..u r simple gorgeous..love the shorts..! Matching shoes with the buttons is a great idea, looks good! This blouse is gorgeous and I love how you pulled off this look!